know that you need to do something about your situation as the weight is creeping on, your fitness levels are dropping, and you know that only a life style change will help you. Know that it’s time to change but have not got a clue where to start. Again, you will benefit from this book. Hi, I’m James Atkinson (‘Jim’ to my friends and readers). I’m a qualified personal trainer and fitness coach, competing bodybuilder and have a burning desire to help others reach their fitness goals. I have been training for over fifteen years. This training has taken me from long distance running to bodybuilding competition. It is fair to say that I have learned the secrets of weight loss and fitness from my own personal journey. I have been fat, skinny and muscle-bound throughout my fitness career and I really get fulfilment from helping and advising others when it comes to their goals. So this book is all about fitness for the beginner. Believe me; I can empathize with the beginner. There is so much contradicting information out there today that it will confuse the training newbie to a point that it will actually kill their potential. It is for this reason that I wrote this book. 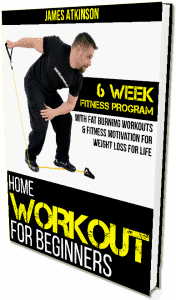 If I was overweight, had no motivation, but knew what I know now, I would start my weight loss / fitness journey with this 6-week home workout. Good luck, and remember that I am always happy to help wherever I can. I strongly believe that anyone can get the fitness results that they want. It just takes a bit of consistency and work. To help you along with the diet aspect of your journey, I have created this PDF for you. The PDF holds some of my very own recipes. Everyone who knows me knows that I love my food! But living a healthy lifestyle means that some of the best foods are out of bounds… Or are they? I have messed around in the kitchen and created some great recipes that are low in fat, low in sugar and high in quality nutritional value. As a thank you for your interest in my book, I would like to offer you these 7 healthy recipes that will really help to boost your results!